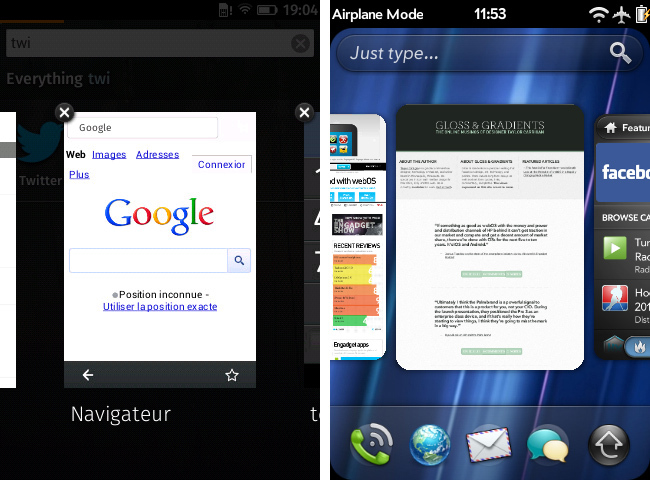 Following Palm’s trails, Mozilla is pushing its own phone OS based on Web technologies. Not to end the same way, Mozilla is betting on openness by allowing anyone to build FirefoxOS phones and apps. The corporation has also decided to start with emerging markets, leaving the western markets to Android, iOS, Windows8 and others. The first dedicated handsets just came out last week. Built by the spanish company Geeksphone, the Keon and the Peak are not targeted to end users: they are development devices. I ordered the cheapest one to see what the user experience is like, and maybe create an app in the future. Even if the Keon is meant to be used for development, I guess some people will want to use it as their main phone (even if they shouldn’t). For them, here is what the hardware feels like. Costing approximatively 100€, the Keon is on par with similarly priced Android devices. The device is light and not too thick (approx. 12mm). The Product Expert review describes this camera: the body is made of a rubberized and soft plastic that feels pretty good. The device has one 3MP camera on the back, one micro USB port, one audio jack, one loudspeaker, a power button and a volume rocker. Even if the color is rather unusual for a phone, the industrial design is pretty good for a cheap phone. Now let’s see what’s inside. The CPU is a 1GHz Qualcomm Snapdragon, the small internal storage (4GB) is dedicated to the system and cannot store media files. You will have to add a micro SD to take pictures, watch videos or listen to MP3 files. The device supports 3G, WiFi N, Bluetooth 2.1 EDR, has light and proximity sensors, a gyroscope and a GPS. Considering they are targeting emerging markets, the included FM radio is a smart addition. Consumers will be happy to be able to listen to music without having to consume their data plan or purchase tunes. The screen is probably the most important part of the phone and is probably the most disappointing. The resolution (320×480) is standard for the price, but the quality of the display isn’t great. The most visible problem is color rendering. 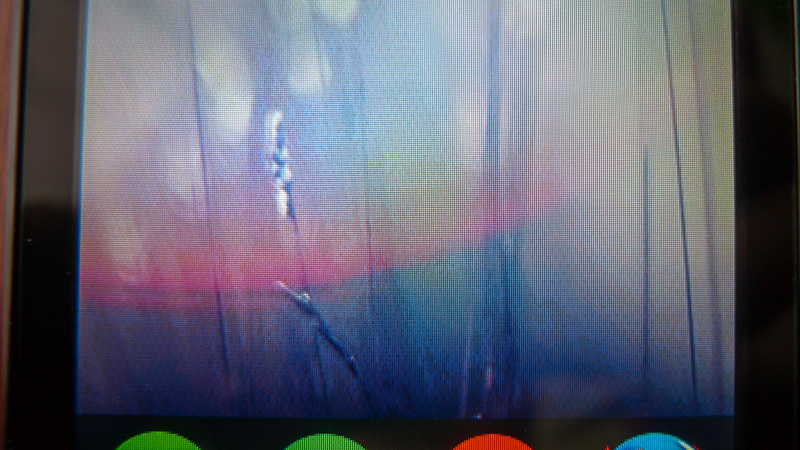 I don’t know how many colors the screen can display, but we can clearly see dithering and banding problems on gradients. Most people wouldn’t mind, but as a designer, it’s hard not to notice. The battery is a 1580 mAh Li-Ion pack that probably won’t last more than one day of moderate use. Like most smartphones, you will probably have to charge the device every night. Overall, the Keon is what you can expect from a 100€ phone : a device with compromises to make it affordable. Can the OS bring more value to it? a set of standard apps: telephone, contacts, messages, e-mail, calendar, camera, clock, videos, photos, music, radio, HERE maps, usage, browser and marketplace. There are no widget or live tiles. If you like to get information at a glance, you’re out of luck. The interface feels a bit dated and has some way to go to match what Android and iOS offer. Icons are not always consistent and feel amateurish sometimes. Font rendering is OK and the standard font is a nice and modern sans serif. Animations can be found everywhere and are smooth most of the time. Globally, the UI is responsive, except when the CPU is struggling with a computing intensive task obviously. On the user experience side, FirefoxOS has borrowed many things from iOS and Android, and feels familiar if you’re coming from one of these worlds. The lockscreen doesn’t do much. It displays the time and allows you to access the camera quickly or to unlock the phone. Both actions requires 2 gestures: a swipe to reveal the buttons, and a tap to activate the selected option. It’s more work than on the iPhone for instance. The homescreen is similar to the iOS one. It can only be scrolled on one dimension, which is a good thing I think. Knowing where you are is easy, and you simply flick through the “cards” to browse. There are 3 kinds of cards. The first one is a blank one that only displays the time. I’m not quite sure what its purpose is. When you scroll to the right, you’ll get the second type of cards. These cards are shelves for app icons. When you scroll to the left, you’ll get to a search engine, to find stuff in your phone or on the Web. Just like iOS, you can long-tap icons to enter “reorganize” mode so that you can delete or move apps. The notification center is inspired by Android. You pull it from the status bar and it provides a list of the last notifications. The notification center also has 5 buttons. The first ones turn on or off WiFi, data, Bluetooth and airplane mode. The last one is a shortcut to Settings. The task switcher can be accessed by pressing the home button during 2 seconds. This feature reminds me of webOS with its card metaphor. You can even throw a card away (swipe up) to delete it. The bundled apps are fairly straightforward and usually offer the minimum feature set. Unfortunately, it also applies to the browser, which is disappointing. Besides opening web pages, it only has tabs, bookmarks, history and settings to clear browsing data. That is literally all. Nothing more. No private browsing, no way to change the default search engine, no sharing, no synchronization. After a few days of use, I also stumbled on a few bugs. I’m running Boot2Gecko 1.0.1.0-prerelease which is a developers preview, so it was to be expected. According to Mozilla, updates are coming and will fix those issues. 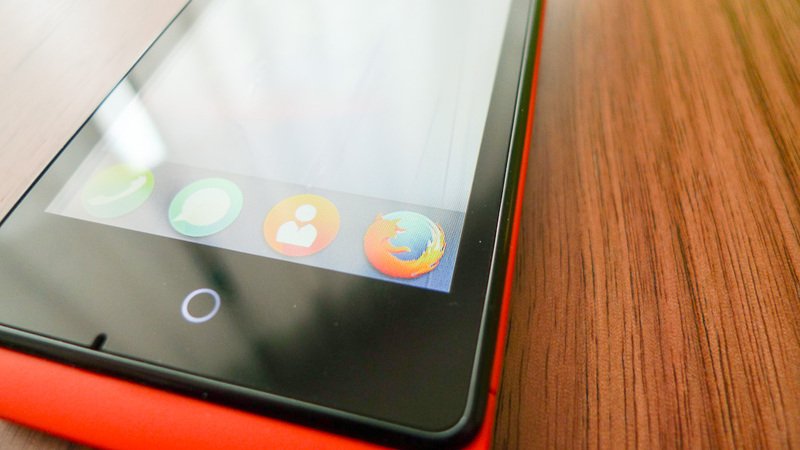 At the end, FirefoxOS is a promising OS for entry level phones but Mozilla still has some work to do to make it a solid operating system. For a developer preview, the OS is already impressive and I can’t wait to see what innovative paradigms Mozilla can bring to the game. It’s nice to have an actual device for development. I’ve already started to develop apps for the OS. I’ll probably write a new article to tell you what developing for this platform is like. 1) We expect to roll out incremental OTA updates quite often, so most bugs are in the process of being fixed. Regarding GPS, it should work, although first time use may require a long time to acquire data and build the satellite database. 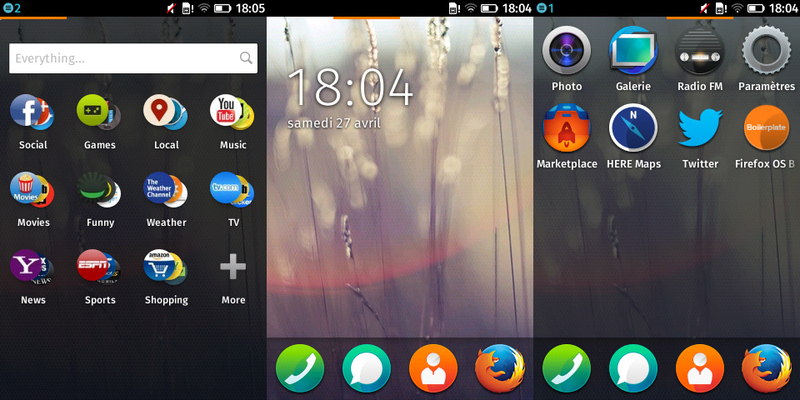 2) Firefox OS does not yet support dual memory partitioning. In the near future we expect that you will be able to take advantage of the internal memory too for media. Thanks Javier for the additional info! About the back button. It is a design choice, but the UX team got there ! Indeed, the back button itself is wider than it looks like. If you touch on the very left part of the title bar (on the title text), it will be activated. Do not worry about touching it exactly on its own ;). Making the tappable area larger is the least they can do. But a problem remains: users will still doubt they can hit the target confidently, and will make more efforts to try to reach the target anyway. I hope that for developer phone, OTA updates comes periodically and it have always new OS. I was looking for good review. Thanks for such a detailed review! Can smb write about the battery life (speaking hours or just holding time)? Could you please confirm gyroscope, beside accelerometer and digital compass, is present in Keon? I’d like to buy it, if it’s got all, but I think it hasn’t. Doesn’t G-Sensor just mean accelerometer, especially since Peak+ adds compass, and that one’s more expensive?